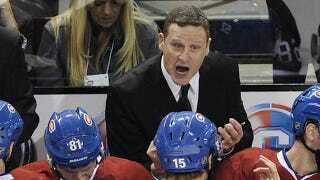 Montreal Canadiens' interim head coach Randy Cunneyworth doesn't speak any French. This is apparently such a problem among fans that the team's GM had to address the issue with the sort of groveling, mealy-mouthed statement you give when your coach blows a .48 on his Breathalyzer. "We're disappointed and we're sorry if we offended anybody by hiring someone who is not bilingual right now, but when you're in the middle of a season and you're trying to effect change and you're having the difficulties we were having, you evaluate all your options," said [Canadiens' GM Pierre] Gauthier. "We felt the best option at this time was to work from within the organization. Those things can be taken care of in due time, but having a bilingual head coach of the Montreal Canadiens is very important and it's something that will be part of our decision going forward." That's the Québécois version of an ultimatum. Cunneyworth, for his part, is vowing to learn the language, and good for him. Since we're nothing if not helpful, let's start him off with a simple idiom: "Je suis foutu."